Disclosure: I received this product free for review from Bottoms Up Boutique. All opinions remain my own. Ah, the endless puzzle of overnight cloth diapering! We need something absorbent enough to hold 12 hours of pee without being too enormous so that baby is uncomfortable. Some babies wake up when they feel wet. Overnight diapers are often the culprit when our cloth diaper laundry gets stinky. So is it impossible? Not by a long shot! Does it sometimes take a couple nights or more of wet sheets to get it right: yes. Is it worth it in the long run? Absolutely! I’ve found two overnight solutions that work really well for us: a combination of inserts anchored by the BumGenius Flip Overnight Insert or the newly tested and approved TotsBots V4. If you are wondering if things you already have on hand might suffice overnight, check out this post of overnight diapering tips. 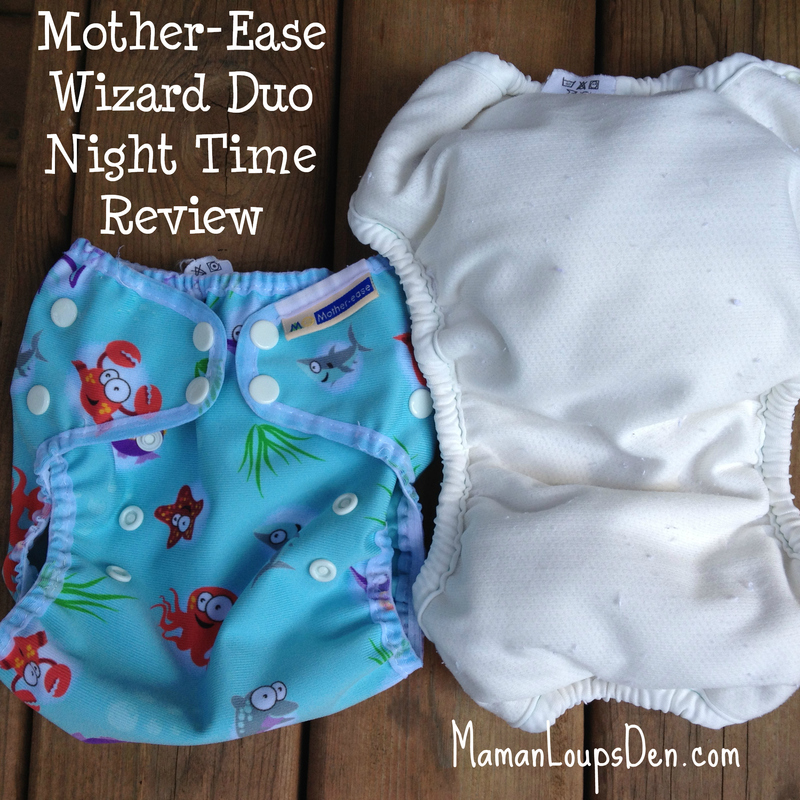 When I was using fitted diapers overnight, my bullet-proof cover on top of them was the Mother-Ease Airflow, so I was very enthusiastic about trying another Mother-Ease product overnight. 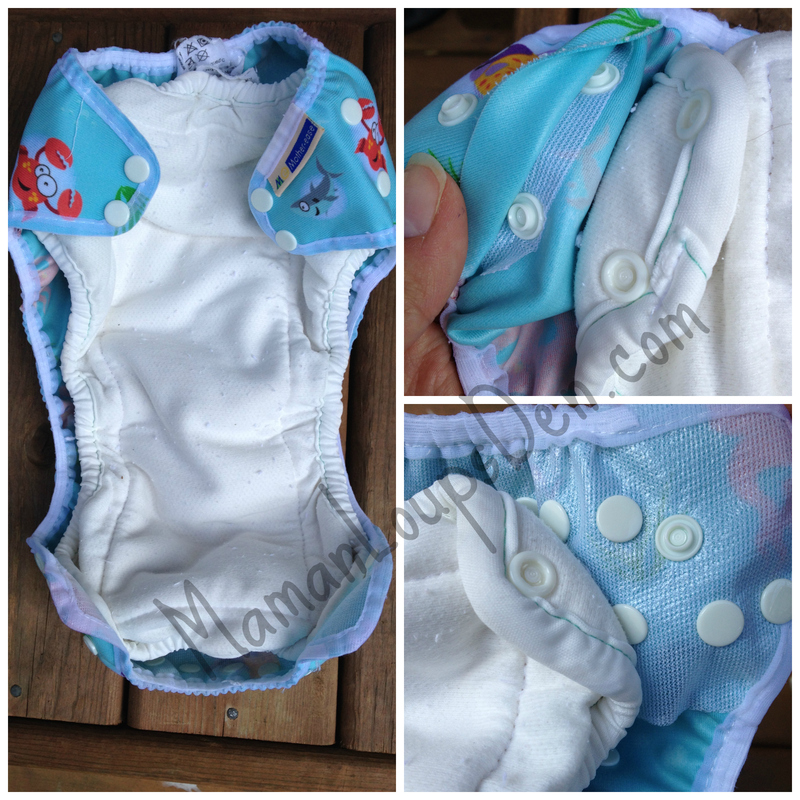 Like the AirFlow cover, this cover is perfect for covering the bulkier inserts required for overnight diapering. I love the full coverage and the soft casing around all of the elastics. Even when I snap it up snug (and a snug fit is a must to avoid leaks), Cub doesn’t wake up with red marks on his skin. I have used it easily on top of the largest Bummis prefolds (and those are massive). Despite offering maximum coverage overnight, it is still a trim enough fit with a light-weight fabric so that it’s not too bulky with a smaller insert during the day. The cover is easy to wipe clean if necessary, but I definitely do toss it in the laundry after one use overnight. Realistically, you could definitely do a quick hand wash of the cover and hang it to dry so it’s ready for the following night. If you’re not a fan of having to build an “overnight diaper sandwich” with a combination of inserts, boosters and liners, you’ll be glad to find out that you can get the same effect with just one piece! The stay-dry layer made of polyester is a must for sensitive skin or babies who hate feeling wet. What I would improve upon with this insert is the dry time. I find it still feels damp out of the dryer, and I honestly wouldn’t even attempt to line dry it. What would make this insert more efficient for both dry-time and ease of laundering would be if it opened on both ends to expose the absorbent core both to the laundry water and to the heat of the dryer. Once I got the right adjustment (I originally snapped it too loose), we have no leaks overnight and without any additional booster! You can buy Mother-Ease products from Reanna at Bottoms Up Boutique! Tiffany, funny you should ask, I just made myself a note to make a post about my “conclusions.” You know, I think that, although it’s the “fussiest” option, I prefer making the insert sandwich BECAUSE I’m finding it the easiest to launder. The inner of the Mother-Ease insert is super absorbent, but I am getting stink even with my perfected wash routine, I think because the inner is never fully expose to the laundry water. The TotsBots are perfect, but almost too pretty for always using only over night… and not as easy to rinse. The Flip inserts are so easy to thoroughly rinse and also so easy to “treat” if you do have a stink issue since they’re just cotton. I am planning to figure out the cost difference… but I did get my Flip inserts/GroVia boosters second hand. I hope that helps!!! Yes, thank you! I also like using an insert sandwich, but am finding right now, while my LO thinks flipping and squirming is so exciting, it is hard to keep all inserts where they need to be. I have some new Tots on the way, but like you, am wondering if I actually want to use them overnight! I have been reading and re-reading your overnight diapering entries lately! I’m trying to figure out the best overnight solution for us. I have been using hybrids with wool and only get the occasional tummy leak. But like you mentioned about the Tots, my hybrids are too pretty to never see the daylight. Plus I’m also concerned about the stink factor.I will consider this option as well. I am shocked that you would recommend tots bots v4 for overnight! I guess I have an extremely heavy wetter. I use tots bots v4 with the snap in booster during the day and have no issues with leaks but would have never considered using overnight. During the day I use hemp boosters in almost all my diapers to keep leaks at bay and that’s changing her at least every two hours. For some reason my BG Freetimes are good though for 2 hours. Strange?